The popular and controversial Ionic Detox Foot Bath is one of the many emerging detox products that has taken up residence in the natural healing product market. People look for cleansing methods to get rid of the toxic build-up that they are exposed to daily because they recognise the symptoms of a toxic overload in their bodies. 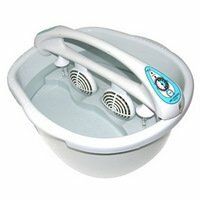 Amongst the variety of home detox methods and products there is the Ionic Detox Foot Spa or bath. If fasting or juicing is not for you, then this home detoxing method might interest you for your detox plan. What Is an Ionic Detox Foot Spa? The ionic detox foot machine is in essence a foot bath but not an ordinary foot bath. It is machine designed to aid the body’s natural detoxification process. The spa is filled with water and then you place your feet in the warmed water while an ionizer sends an electric current to pull out toxins from the body causing it to detox and release some of these toxins back into the water through the pores on the feet. The “science” of it is explained below….. The detox foot machine works because of the combination of the warm water, the ionization and the thousands of sweat pores on the soles of the feet. The ionic detox foot bath consists of a tub where you can place your feet in water as well as a part that uses osmosis or electrolysis to break some of the water into positive and negative ions. The ionizer array is placed in the water with added sea salt and this produces a mild electric current. Metals within the array in combination with water and added sea salt generate positively and negatively charged ions. The negative ions are then absorbed into your skin and travel through your body attracting positively charged toxic ions (toxins are supposedly positively charged) to them and encouraging natural detoxification of the body by osmosis. The toxins are neutralized because they are attracted by the highly-concentrated ion field in the ionic detox foot bath water. These toxins are then released back into the foot bath water via the thousands of pores that you have under your feet. You will notice a change in the colour of the water as the toxins are released. Well actually the change in water colour is due to the reaction of the salt, the array and the impurities already in the water. Detox Foot Bath manufacturers will say that the various colour changes of the water is an indication of the area of the body that is experiencing detoxification and cleansing. The body is designed with natural cleansing mechanisms such as the liver and kidneys but today we are bombarded with many different toxins from pollution, smoking, harmful substances in our food, etc. Due to this increase in the amount of toxins our bodies are often not able to get rid of all these toxins without some additional help. This leads to a toxic build-up causing us to feel lethargic, get headaches, allergies, pain and many other problems because our body is no longer coping with this toxicity. A detox plan that is regularly incorporated into your lifestyle will stand you in better health in the long term. A Detox Foot bath is just one of many available products for detoxing your body. A detox foot machine helps to encourage natural body detoxification so helping to relieve the symptoms mentioned above. The advantage with this system is that you can use it from the comfort of your own home and it also does not require any drastic measures such as fasting. It certainly is a comfortable way of cleansing toxins from the body. Boosting the immune system to help your body better fight disease. Another advantage is that by exposing the body to these negatively charged ions the body’s pH is also brought to a more balanced acid-alkaline state which can prevent the growth of some diseases such as cancers. In certain circumstances the use of an ionic detox foot bath is not advisable such as for pregnant or breast-feeding women, those with a pacemaker or heart problems, those on medication, people who have had an organ transplant or are due to have one. A detox foot spa is said to naturally detoxify the body in the comfort of your own home and without any drastic measures and as a result you may experience many benefits such as increased energy, improved immune system, relief from some pains and general improved well-being.